Having to do with tailors or their craft. While not every profession demands it, most expect their employees to dress a certain way. Depending on the industry and the intensity of the negotiations, the cut of a sales rep's suit could be all that stands between a major deal and the client walking out the door. These professionals know the importance of giving sartorial matters their attention, and typically don bespoke business wear. Sartorial refers, in its broadest sense, to anything or any aspect associated with clothing, menswear in particular. This can be anything from an article's look and feel to the process by which it was made. To describe a piece of clothing as sartorial might indicate that it is fashionable or of high quality. However, sartorial can also be paired with a trait, creating such combinations as "sartorial elegance" or "sartorial sense," and ascribed to people as well as clothing to illustrate a keen eye for detail in what one wears. Sartorial can be paired with any noun, though, to describe a particular approach to how one dresses, from attuned to oblivious to anything in between. Sartorial also possesses the more specialized meaning of a thing pertaining to tailoring. 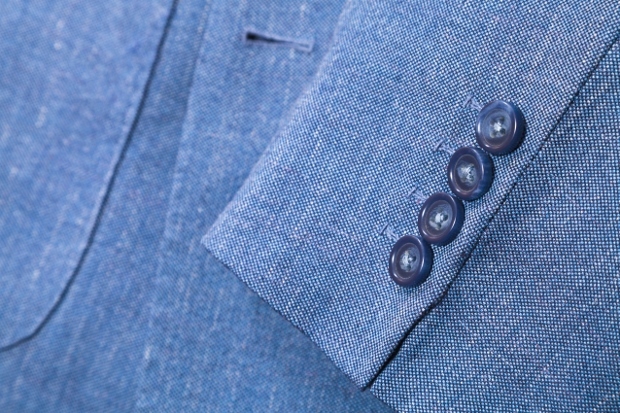 In this context, sartorial can refer to the artisans themselves or to any step in the process by which tailors create a piece from start to finish. Example: His reputation for a keen sartorial eye won him the business of all the best-dressed men in town. Example: The suit had not been worn in such a long time that it had long since passed from mainstream sartorial trends. Sartorial originates from the Modern Latin "sartorius," which came from the Late Latin "sartor," meaning "tailor," or literally, "patcher." Both these words trace back to the Latin root word "sarcire," which translates to "to patch" or "to mend." While "sartorian" emerged in English in the mid-1600s, sartorial did not enter the language until the early 1800s, combining the Latin root "sart" with the suffix "-ial," meaning "of" or "relating to." Sartorialism: This noun form of sartorial means the practice of being concerned with or dedicated to clothing, and dressing fashionably. Sartorialism can encapsulate any degree of fashion-consciousness from an amateur trying to look sharp to a major designer seeking to set the next great trend. It is worth noting that this has a bit less relation to tailors or their work than the root upon which this is based. Example: His sartorialism was not lost on his friends, as they often lauded him for how he always seemed to out-dress them all. Sartorialist: A sartorialist is a person who meticulously attends to their own clothing and closely follows fashion trends. In essence, a sartorialist practices sartorialism and, similarly, can range from self-avowed novice to fashion icon. Example: With his crisp, modern suiting designs made popular by Daniel Craig, Tom Ford is a leading sartorialist in the fashion industry. Sartorially: This adverb captures any action that has a relation to tailoring or, more often, clothing or style. Usually, it is used to indicate stylishness. Example: His sartorially cut suit caught the attention of everyone at the charity ball. Through the door came a being of intense vivacity, impeccable sartorial integrity, and intermittent intelligibility. Here, Bisson describes the person entering as not only lively, but as having an acute sense of stylishness in their dress. If your style is sartorial, you look sharp (for real). If you're sartorial, you wear white after Memorial Day. Bring out the linguist in you! What is your own interpretation of sartorial. Did you use sartorial in a game? Provide an example sentence or a literary quote.